On July 25th myself and my colleague cello player played at a small gathering at Penn State University, Eberly Campus in Uniontown, PA. It was an open house for the University House which has an interesting history, going back to 1850’s. Originally, it was a farm house on the Wood farm. The Wood family purchased the farm from the son of Christopher Gist in the 1740’s. The land was part of a settlement awarded Christopher Gist by King George the Third of England for his service as a guide for General Braddock during the French and Indian war. 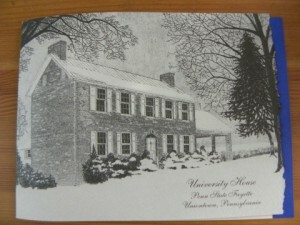 The house had eight different owners before becoming part of the Penn State in 1967. Amazing how little places can hold a lot of history, not far from your own house! It was a very pleasant place to perform, with gardens all around us. Unfortunately, we had to play inside due to the unexpected rain, but I did get a chance to go outside during a break when it stopped raining and look around – it is such a beautiful and peaceful place! The people we played for were so welcoming and appreciative of our playing, we felt very comfortable and at home. It was one of our more memorable performances. I saved the program from the open house with its’ history, and here is the sketch of the house. The second photo was taken inside the Community Center where we played for the second time. 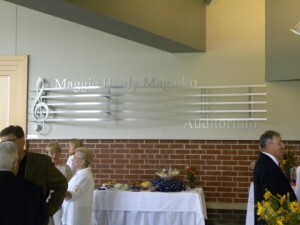 I thought it was a neat picture of treble clef and music staff! For over fifteen years now, I have been a part of Musik Innovations Summer Chamber Music Camp as a string coach. Students from the schools around the area get together in small ensembles according to their level, and form string quartets, quintets, sextets and even octets. After a week of being coached by instructors from our school of music (in between music games, water balloon fights and a pizza party), kids give a concert on a Saturday afternoon, performing pieces that they had only one week to work on. The number of participating kids is not as large as it used to be, but the spirit of music is still in those who attend and we love them for that! Here are some photos from this year’s camp.